In The Borderlands of Science, Michael Shermer takes us to the place where real science, borderline science — and just plain nonsense — collide. 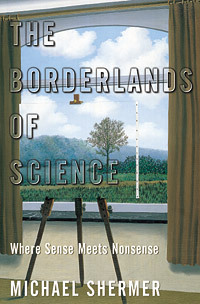 Shermer argues that while science is the best lens through which to view the world, it is often difficult to decipher where valid science leaves off and borderland, or “fuzzy” science begins. To solve this dilemma, he looks at a range of topics that put this boundary line in high relief. For instance, he debunks the many “theories of everything” that try to reduce the complexity of the world to a single principle. He examines the work of Darwin and Freud, explaining why one is among the great scientists in history, while the other has become nothing more than a historical curiosity. And he reveals how scientists themselves can be led astray, as seen in the infamous Piltdown hoax — the set of ancient hominid bones discovered in England that after decades turned out to be an enormous forgery. From SETI and acupuncture to hypnosis and human cloning, this enlightening book will help readers stay grounded in common sense amid the flurry of supposedly scientific theories that inundate us every day. I’m listening to the audiobook version of Borderlands. Beginning with the treatment of Carl Sagan reference is make to figures, which didn’t make it to audio. Are these figures available somewhere else as a companion to the audiobook?